"This is a xenophobic, hateful page. Most of the entries and news featured on this page are directed against the Hungarian minority living in Transylvania and provokes the Romanian population from Transylvania against them. 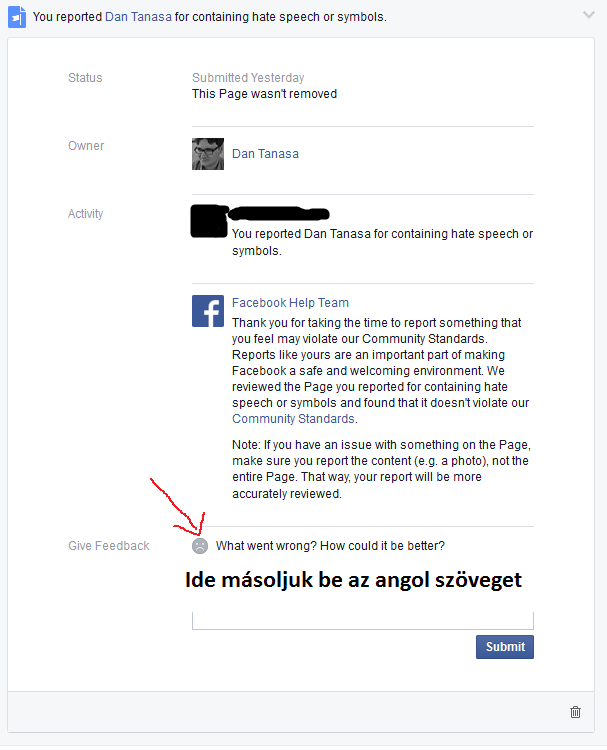 The page's administrator, Dan Tanasa, is continuously calling the Szekler flag a rag and he is denouncing and reporting Hungarian inscriptions. The page's followers regularly write chauvinistic, hateful comments about the Hungarians from Transylvania and are even threatening them. Please delete this page because it violates Facebook's Community Standards. Thank you!" A jelentés menete: https://www.facebook.com/dantanasa.ro?fref=ts Jobb oldalt - Oldal jelentése - Úgy gondolom ennek nincs helye a facebookon - Gyűlöletbeszéd egy rasszra vagy etnikai csoportra irányul.